If we are going to go to space the engineering and fabrication of space structures is going to be completely different than what we are used to. In space you have to get away from gravity that helps and hinders you. You have to plan for fabrication techniques that don’t use water or gases. It looks as if we are on our way. Interesting article from the Daily Mail. I think that my first trip through Grand Central Terminal was in 1968. My mom took me, my brother and sister to the Statue of Liberty on a very cold February day. This was my first train trip, of thousands, into NYC. Now back then GCT was at it’s low point. The station was seedy and the concourse was filled with advertising in an attempt by the bankrupt railroads to get revenue any way they could. The one large, very large memory I have is of the Kodak Colorama picture on the west side of the concourse. Over the years all the pictures on that thing were all excellent. Then there was the frozen custard stand on the Southwest aisle next to the concourse. Along with the pizza stand along the south aisle. All of which went away in the late 1980’s when Grand Central started to get fancified. This piece is rather enthusiastic and exaggerates more or less some of the strange things that exist in GCT. The baggage car at track 61 is NOT FDR’s old car transport. The fact that it’s painted blue means that the care has been to the Metro North Paint shop at least once and that it’s used for maintenance of Way. There WAS a New York Central painted converted troop sleeper on the lower level but that is gone because the track it was on is part of the East Side Access project. The apartment is a fun place to get a drink and all that paneling is wonderful. The whispering hall works. That back passageway with the sloping ramps was intended to be a space for a skyscraper that has never been built. There’s a little museum and library run by a railroad historical society as a meeting room that has a section of the original 20th Century LTD red carpet, the carpet that start the Red carpet. The Oyster Bar is expensive but the oysters and sandwiches are great. The skyscrapers going north for ten blocks from GCT have no basements because GCT IS the basement. While they are no longer used very much both levels have loop tracks to turn trains. These are just some of the fun stuff that exists in GCT. I’ve been through the Terminal hundreds of times and I still find surprises. 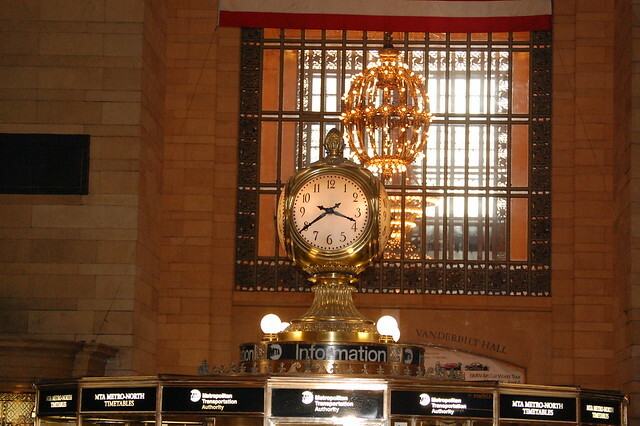 Grand Central has been a show of people going places since the mid 19th Century. Here’s what it was like back in 1906. I can’t tell you how much I wish for that package service. Still, some things never change. Like missing the last train. Well the Broad Group in China has actually been building buildings using prefabricated components with a great deal of success. Broad makes some rather exaggerated claims and I really don’t think that their rate of steel erection is any faster than anybody else’s. Still I would like to see them do a building in NYC to see how things would change in a different environment. Exciting stuff. And you can still get the building toy. I don’t have kids, so that useless for me.